After the uPVC profiles are manufactured, a separate process of strengthening the profiles begins which can be termed as the making of reinforced profiles. Now let us examine each state of the uPVC manufacturing process and understand what goes into the making of the best uPVC profiles. 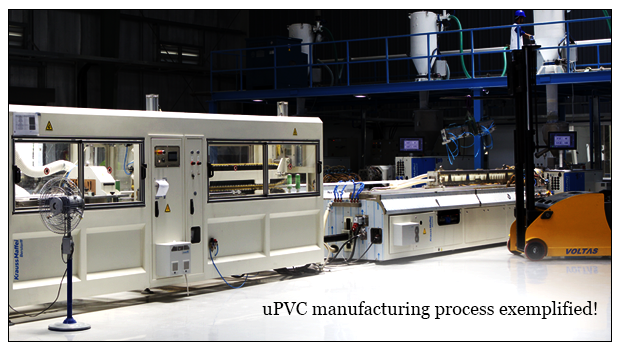 This is the very first step in the uPVC manufacturing process of profiles. There are certain raw materials which are used in the preparation of the resin mix. The raw materials chosen are the of the most premium level. When the mix is prepared supplemental levels of Titanium dioxide (TiO2) and lower level of Calcium Carbonate (CaCO3) are used to make the extruded profiles more durable and resistant to UV rays. For a healthier and environmentally friendly approach, lead-free substances are used in the resin. The extrusion procedure is the main stage of the uPVC manufacturing process. Extrusion is the process of how uPVC profiles are made. The extruded profiles require the desired temperature of 200-275 degree Celsius to be designed. A large-scale automatic mixing equipment which will ensure that the mix is churned accurately. Once the molten mix is ready for the extruded profile, it is cast into a die. The die is used to give the extruded profiles its shape as it is being pulled and stretched. After the extruded profile takes its designated shape, the final stage of uPVC manufacturing processes is put into the picture. The uPVC profiles are now given a water bath and are cooled. After cooling they take the shape of sturdy profiles. After being sufficiently cooled, the extruded profiles are now cut into standardised shapes, then packaging labels and protective tapes are used. In case, there is a requirement of laminated profiles, then the white profiles are customised accordingly. Reinforced profiles involve the use of galvanized steel reinforcements. They are the most suitable form of reinforcement elements for the extruded profiles. Reinforcement is necessary to make the uPVC profiles more strong and robust. It is distinguished as a separate procedure to strengthen the uPVC profiles further. This meticulous uPVC manufacturing process gives rise to the making of better uPVC profiles.